Dennō Coil (電脳コイル, Dennō Koiru, lit. Electronic Brain Coil or Computer Coil), Coil—A Circle of Children, is a Japanese science fiction anime television series depicting a near future where semi-immersive augmented reality (AR) technology has just begun to enter the mainstream. The series takes place in the fictional city of Daikoku, a hotbed of AR development with an emerging citywide virtual infrastructure. It follows a group of children as they use AR glasses to unravel the mysteries of the half real, half Internet city, using a variety of illegal software tools, techniques, and virtual pets to manipulate the digital landscape. Dennō Coil, in development for over a decade, is the series director debut of Japanese animator Mitsuo Iso. It premiered on NHK Educational TV on May 12, 2007. Due to the animators involved in its production and its unusually high-profile television broadcast time slot, Dennō Coil was highly anticipated. An English dub Den-noh Coil was released on Blu-ray and DVD by Maiden Japan in June 2016. In 2026, eleven years after the introduction of internet-connected augmented reality eyeglasses and visors, Yūko Okonogi moves with her family to the city of Daikoku, the technological center of the emerging half-virtual world. Yūko joins her grandmother's "investigation agency" made up of children equipped with virtual tools and metatags. As their research turns up mounting evidence of children who have been whisked away to the mysterious "other side" of reality, they find themselves entangled in a conspiracy to cover up the dangerous true nature and history of the new technology. Dennō means "computer" and is analogous to the archaic English term "cyberbrain". In the series, the word is used to differentiate between virtual and real, e.g. "dennō cat". The title of the show itself, Dennō Coil, refers to a dangerous separation of one's digital self from the physical body. Yasako uses her augmented reality eyeglasses and ear monitors. The children access the virtual world through Internet-connected visors, which they refer to as megane, the usual term for protective or corrective eyeglasses. The visors allow them to see virtual reality superimposed on objective reality. To visually confirm something as virtual, the children often lift their visors from their eyes. The visors also work in conjunction with futuristic ear monitors placed behind the ear, which allow the wearer to hear sounds from the virtual environment. Interaction with the virtual world is handled in a similar fashion to contemporary video games. Software tools are visually represented as tactile tools (e.g. a fishing rod) which occupy 3D virtual space and must be manipulated by hand. Sophisticated tools include metatags, visually represented as o-fuda (paper talismans), and efficacious chalk circles called angō, meaning "code", which have a variety of effects. Virtual objects such as pets cannot be recalled or reset; when a pet runs away, it must be chased and caught in 3D space. Virtual objects and pets are also susceptible to a form of "death" by data corruption or deletion. For a virtual object or pet to be deleted from cyberspace, it can be attacked by a virtual weapon, such as Searchmaton's beam weapons. While users of dennō eyeglasses cannot be physically harmed by virtual weapons, their costly personal data and virtual possessions can be damaged. Searchmaton, the maintenance and antivirus bot of Daikoku, is constantly on the lookout for illegal objects and damaged space, which includes corrupted or obsolete space, computer viruses, and the forbidden pets and tools that the protagonists own. The virtual side of Daikoku is shown as an emerging space, requiring some maintenance. In the first episode, the virtual dog Densuke falls into an obsolete virtual space at a physical construction site. Due to a version mismatch between the dog and the space, Densuke finds himself glitching and destabilizing in the environment. Eventually Searchmaton reformats the obsolete space. It is also shown that the virtual space represented in Daikoku is tied to the city's electronic infrastructure. In one scene, Fumie Hashimoto uses a metatag to control a traffic light. The underground virtual currency of Daikoku is known as meta, which is equivalent to the Japanese yen, and is traded in the form of "metabugs". The market value of a metabug can change according to its supply and demand. It is explained that a metabug represents a special kind of software bug, and from their unique properties they can be refined into tools or metatags by skilled craftsmen. Metabugs, which are especially abundant in the city of Daikoku, can only be unearthed in damaged or corrupted spaces. Metabugs are also a target of deletion for Searchmaton. Despite being a computer environment, the virtual side of Dennō Coil has a tangible and sometimes organic design, with much of the interaction requiring physical effort in 3D space. In order to hack into a corrupted virtual space in Daikoku, Fumie Hashimoto handles a software spray can loaded with so-called "black bug spray". A virus on the run from Searchmaton leaves behind a (virtually) tangible, evaporating black trail of raw "dennō substance". The virtual dog Densuke uses his nose to follow the trail. However, dennō eyeglasses do not grant the user the ability to "feel" the virtual world. Therefore, using software tools and playing with virtual pets requires some degree of active make-believe from the user. Densuke explores an abandoned space. A special type of rogue virtual organism known as "illegals" populate the damaged and obsolete spaces of Daikoku City. The protagonists sometimes hunt special forms of illegals in the hope of collecting valuable metabugs. Illegals, originating from "the other side", sometimes become lost and isolated in the city and express a desire to return to their "homeland". Some humanoid illegals known as Nulls can whisk people away to "the other side" by inducing "dennō coil"—a comatose state where the victim is trapped in VR. In order to spatially synchronize virtual space and real space, users of internet-connected dennō eyeglasses constantly upload the status of physical space to the virtual infrastructure. In the fifth episode, the protagonists encounter a sparsely visited junkyard of buses on the fringes of wireless internet connectivity. Due to obsolete AR data, the buses are depicted by dennō eyeglasses as being in far better condition than they actually are. The characters sometimes exploit the discrepancies of desynchronization when dealing with metabugs and illegals. The AR world is filled with mysteries of and ghostly tales about children losing their soul to "the other side", a supposed ghostly realm of VR hidden in the AR environment. The protagonists continually gain a clearer picture of the true nature of the glasses and cyberspace throughout the series. It is eventually revealed that the glasses form a two-way brain-computer interface known as Imago, first used in experimental medical treatments. However, there are substantial health risks in prolonged use of the interface, and the interface itself presents the possibility of a coma or brain death through the "dennō coil" phenomenon. At the same time, an experiment gone awry gave birth to Michiko, a digital life form that assumed control of Coil Domain—referred to in rumors as "the other side". Due to their inability to erase Coil Domain, Megamass opted to instead create a new layer of augmented reality space on top of Coil Domain, where the influence of Michiko and Imago was lessened in order to minimize the occurrence of dennō coil. Much information regarding Coil Domain, Imago, Michiko and dennō coil has been aggressively covered up by the technology conglomerate, Megamass. A recurring theme throughout the series is the depiction of torii, which are traditional Japanese gates that symbolically mark the transition from the profane to the sacred, either as actual infrastructure (virtual or real) or in chalk patterns drawn by characters in the series. Episode three opens with the monologue, "According to rumors in the industry, there are hidden functions in the [dennō] glasses that are better left unmentioned". It is also rumored among children that one can "lose their soul" by venturing too far into obsolete space. Some children possess an extra sensitivity which allows them to perceive sounds and voices emanating from obsolete space, metabugs, and so on. Much of the AR environment is steeped in urban legends and ghostly tales, and the series highlights the special intuition, extra sensitivity and sense of closeness that the children have to the emerging AR world. A PSA web graphic, "Searchmaton is our friend". It is shown that the virtual side of Daikoku is heavily regulated and restricted by the Searchmaton software, therefore the children of Dennō Coil are circumventing those regulations through their mischievous adventures and their trade of "illegal" software tools and pets. Fumie Hashimoto describes Searchmaton as a powerful piece of software that, despite its blunt strength, is easily fooled due to its predictable behavior and unbalanced priorities. She also laments how it shows no leeway by destroying even the most harmless of virtual toys and pets. Beginning with episode six, the show often highlights the lack of nuance and the divide of understanding between the overprotective adult administrators and the child protagonists regarding the regulation of the emerging digital frontier. According to the series director, Mitsuo Iso, a major theme in Dennō Coil is the distance between the characters, such as Yūko's inability to feel the fur of her own virtual pet, in addition to all the relational tensions and divides of understanding between the characters in the series. In Iso's translated words, it conveys how "there will always be a distance between people, and even between things that seem within ones' reach. And that one must walk down a long, thin and winding road before they reach one's heart. There are tons of obstacles. It's in fact like the roads in towns of old." Nicknamed Yasako, which is another reading of 優子 meaning "gentle girl". With her sister Kyōko and her two parents, Yasako moves to the city of Daikoku to live with her grandmother, Megabaa. Yasako is a sweet and passive girl who follows the lead of Fumie, who eventually initiates her into Megabaa's Coil Cyber Detective Agency as its eighth member. Yasako has been to the city of Daikoku seven years ago for her grandfather's funeral. A pair of dennō eyeglasses and the virtual pet Densuke were left to her as a memento. During her time in Daikoku, she coincidentally wandered into the Coil Domain where she befriended a young boy with the codename 4423. After Yasako returns to live in Daikoku, her hazy memories of that enigmatic friendship gradually return to haunt her. Her father Ichirō works at a Dennou technology company, Megamass, which deploys Searchmaton in Daikoku. Her birthdate is October 12, 2015. 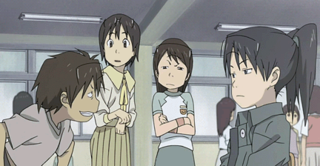 From left to right: Daichi, Yasako, Fumie, and Isako. Nicknamed Isako, which is another reading of 勇子 meaning "brave girl", Yūko Amasawa is a powerful type of hacker known as an "encoder" (暗号屋, angōya) who is able to manipulate the electronic infrastructure through sophisticated chalk patterns. Rumored to have familial ties to an AR technology company, Isako uses a Brain-Computer Interface to interact with the virtual world—a function hidden inside the hardware of AR visors and eyeglasses. Isako is, on the surface, extremely arrogant and antisocial, perceiving human relationships strictly as hierarchies of power and manipulation. Isako relentlessly chases special illegals in order to collect kirabugs. She is secretly driven to this task in the hopes of finding her brother in "the other side". Her birthdate is April 4, 2015. She is the little sister of Yasako. She is young and childish and often gets in the way of danger. She shows a number of fixations; the most common one is the repeated use of the word "poop" when pointing at people and other items of interest (Daichi can even decode her "poop! poop!"-language). Fumie is the seventh member of the Coil Dennō Investigation Agency. She befriends Yasako almost immediately, and has a quick-witted, playful nature. She is an experienced hacker and an adept user of metatags, and makes use of her digital pet, Oyaji, in her investigations. Akira is the youngest member of the Daikoku Hackers' Club. He agrees to spy on the Daikoku Hackers for his older sister, Fumie, by joining their ranks as a double agent. Akira makes use of his digital pet "Micet", which he illegally patched to unlock its video recording feature. Haraken and his aunt, Tamako. Nicknamed Haraken. He is the president of the Biology Club, and is the Coil Dennō Detective Agency's fifth member. The polar opposite of Fumie, he is shy, reserved, and secretive, especially of his personal connection to Searchmaton. Haraken is personally vested in researching internet viruses and illegals on behalf of Kanna Ashihara, his childhood friend, who died by traffic accident under mysterious circumstances in the previous year. He is secretly tormented by the idea, that a part of Kanna may still exist somewhere on "the other side". He begins to have feelings for Yasako but is distracted by Kanna's Incident. Tamako is Haraken's aunt. As a consultant for Daikoku's Cyberspace Administration, she holds authority over the programming of Searchmaton and is responsible for its highly aggressive behavior. She is especially intent on preventing Yūko Amasawa from accomplishing her mission to summon a portal to Coil Domain. However Tamako herself is well-versed in hacking and the crafting of metatags, and she often oversteps her authority in investigating the protagonists' activities. Her fervent pursuit of making augmented reality a "safe place" stems from her re-opening the portal to the other side in her early days of hacking, thus initiating the constant battle between obsolete and new space. Daichi is the founder and leader of a group of pranksters at school called the Daikoku Hackers' Club. Hot-headed and quick to take offense, he holds an ongoing love/hate rivalry with Fumie stemming from early childhood. With the appearance of Isako, Daichi quickly finds himself defeated and cast out of his own group after challenging her. While often perceived as a troublemaker, Daichi is tagged by his awkward friend, Denpa, who holds him in high regard for befriending him in the face of school harassment. Daichi is, somewhat ironically, a constant target of Kyōko's antics. He has deep feelings for Fumie but Fumie is dense about this even though she actually cares for him. Sanae Okonogi, or Megabaa, whose nickname stems from the Japanese words for eyeglasses (メガネ, megane) and grandma (ばあちゃん, baachan), is the owner of the Cyber Candy Shop Megasi-ya. Megasi-ya also sells software and metatags. Megabaa is the primary craftsman of metatags in Daikoku, and is an expert software programmer. She is also Yasako's grandmother, and the head of the Coil Dennō Detective Agency. Her cunning frugality terrifies Yasako among other characters. Her deceased husband was a researcher in the early medical application of dennō technology. His secret legacy is slowly unveiled throughout the series. The antagonist of the series. He is a former acquaintance of Tamako Harakawa, and a collaborator in Isako's quest to open the door to the "other side". His ultimate aim is to bring down the Megamass company. The younger brother of Nekome. He is jealous of Isako and mercilessly bullies her, but takes a liking to Yasako and becomes split between his loyalty towards his brother and his desire to protect her. He has a modified pink micet named Momoko (モモコ). Searchmaton, Satchī (サッチー) for short, is a bot and antivirus software deployed by the Cyberspace Administration of Daikoku. Its task is to debug and maintain the virtual side of the city. Its secondary function is to seek out and disable illegal AR devices, software, and viruses, making it a menace to the characters of the series. Searchmaton can deploy up to four spherical drones to aid in its task. While Searchmaton can patrol the city streets freely, it is prohibited to enter private property such as houses, and other spaces such as temple grounds and schools, because they lie outside of the responsibility of Daikoku's Cyberspace Administration. The protagonists utilize this and other predictable aspects of Searchmaton's behavior to escape its grasp. Searchmaton, striking terror into the hearts of children, is ironically painted with a smiley face and punctuates its violent attacks with the cute catch phrase "Me Satchī!" (僕サッチー, boku Satchī) which Yasako's father had a part in developing. Tamako often hijacks Searchmatons for use as her personal digital henchmen. They are later replaced by the upgraded Searchmaton 2.0 in the form of cubes which have upgraded weapons and shielding, and can combine like the Q-chan to perform wide area re-formatting. Since the 2.0s are under government jurisdiction they can enter areas inaccessible to Satchī including shrines, and also private property when authorised. A mysterious illegal who resides in Coil Domain. The child protagonists often whisper of her ghostly ability to pull people to "the other side". Mitchiko is also a product of Yasako's kiss and Isako's sadness. Composed and performed by Ayako Ikeda; arranged by Tatoo. The newspaper Mainichi Shimbun suggested the technology shown in the series would have a great influence on the future, comparing it to the way Snow Crash influenced the development of Second Life. 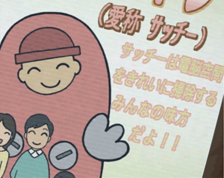 It also praised the series for showing technology that was very Japanese, and concentrating on how the children grow. Dennō Coil, along with three other animation works, was awarded an Excellence Prize along with Tengen Toppa Gurren Lagann by a jury at the 2007 Japan Media Arts Festival. The Grand Prize was won by Summer Days with Coo. At the seventh annual Tokyo International Anime Fair, Dennō Coil won top honors in the Television category along with Tengen Toppa Gurren Lagann. At the 46th Japan Science Fiction Convention, Dennō Coil was the only winner of the Seiun Award in the media category which covers all non-literary works, such as movies and TV series. Mike Toole of Anime News Network named Dennō Coil among his top 10 overlooked anime of the 2000s, calling it "sort of a spiritual successor to last decade's Serial Experiments Lain" and "one of those shows where the end of each episode triggers immediate desire for the next episode." ^ "Anipages". Retrieved May 18, 2007. ^ "Maiden Japan Licenses Den-noh Coil Anime". Anime News Network. February 23, 2016. Retrieved September 13, 2016. ^ "Mitsuo Iso interview". Animage. Volume 333 (March 2007). ^ "Mainichi Review of Dennō Coil". Mainichi Shimbun (in Japanese). Retrieved August 21, 2007. ^ "Japan Media Arts Festival Award-winning Works for 2007". Retrieved December 6, 2007. ^ "Eva 1.0 Wins Tokyo Anime Fair's Animation of the Year". Anime News Network. February 26, 2008. Retrieved February 26, 2008. ^ "Library War, Dennō Coil, 20th Century Boys Win Seiun Awards". Anime News Network. August 24, 2008. Retrieved November 3, 2008. ^ Toole, Mike (January 2, 2011). "The Mike Toole Show: The Lost Decade". Anime News Network. Retrieved January 10, 2011. This page was last edited on 9 May 2018, at 11:25 (UTC).